Mobile operator T-Mobile is adding another device to its Android stable: the latest myTouch handset, built by HTC, features a speedy 1 GHz Snapdragon processor, Android 2.2, and a front-facing camera for video calling. Plus, the device support’s T-Mobile HSPA+ 3.5G network for high-bandwidth applications. Unlike FaceTime video chat on the iPhone 4G—which only works via Wi-Fi—the video chat feature on the new myTouch either via Wi-Fi or using T-Mobile’s HSPA+ network, and can be used with Yahoo Messenger or Qik with folks who have compatible mobile devices or PCs. The built-in address book can also indicate users’ availability for video chat. 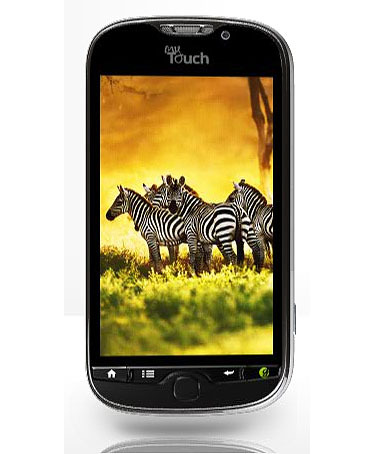 Under the hood, the new myTouch features a 1 GHz Snapdragon processor, a big 3.8-inch touchscreen display, a 5 megapixel camera with HD video capture capability, integrated WiFi and assisted GPS, a pre-installed 8 GB SD memory card. The phone also features three features exclusive to T-Mobile: a Genius Button that enables users to create calls, messages, or email using voice dictation powered by Dragon Dictation, a Faves Gallery for most-contacted family and friends, and a myModes feature that creates customized home screens for users’ different roles: work, home, or (for instance) superhero.